Changes in carpet after installation are common and usually nothing to worry about. The most common problems, such as odors, fluffing or shedding, sprouting, and pile reversal or shading, tend to resolve themselves or can be easily remedied. Wrinkling, however, is a cause for concern. Whatever the issue, if you don’t know how to deal with it correctly, you run the risk of actually making the problem worse. Keep reading to learn more. During and after your carpet installation, you may notice an odor. 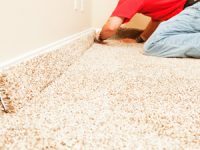 The cause may be the removal of the old carpet and padding or the padding, adhesives, or seaming tape of the new carpet. This odor will dissipate over time. It is recommended that you help the process along by opening doors and windows and turning the HVAC system on full for 48 to 72 hours. Other odors can be addressed with the deodorizing products utilized by professionals. It is not unusual to find fluff and loose fibers on new carpet. They are the normal result of fibers left over from the manufacturing process and, with regular vacuuming, should disappear within a year after installation. You may occasionally find a single fiber sticking up above the rest. DO NOT PULL IT OUT! Simply trim it to match the height of the surrounding fibers. If this persists in a localized area, you should contact the manufacturer’s representative or your contractor. Cut-pile carpets sometimes develop a characteristic called shading, that is, the appearance of shade variations on the carpet. The operative word here is appearance, because there actually is no true shade variation. It is an illusion created by the way light hits the carpet pile. The portion of the pile angled opposite the observer appears lighter and the portion of the pile angled toward the observer appears darker. Vacuuming or brushing the pile easily resolves the problem. Pile reversal is just like shading, only it happens consistently because the carpet pile is strongly oriented in particular directions, likely because of traffic and use. Unfortunately, vacuuming or brushing the pile won’t bring about any permanent change, and carpet manufactures don’t consider pile reversal to be a carpet defect. However, in time, the carpet will lose some of its sheen, reducing the contrast between the illusory lighter and darker areas. Improper installation, poor quality carpeting, improper padding, and other factors can cause wrinkles to appear in carpeting. If the carpet is still covered by a warranty, the installer or the retailer should re-stretch the carpet at no cost to you. If you have problems getting the installer or the retailer to help, try contacting the manufacturer. If the warranty has expired, contact an experienced carpet installation contractor. For more information on how to deal with spots, stains, and odors and keep your new carpet fresh and clean, see our Carpet and Interior Textiles Care Guide.